My DIY Kitchen earth-friendly non-toxic Tile backsplash Project! My New DIY Eco Friendly Backsplash! YAY! I can hardly believe it. Four post-flood years later, my kitchen is beginning to look like a kitchen again! 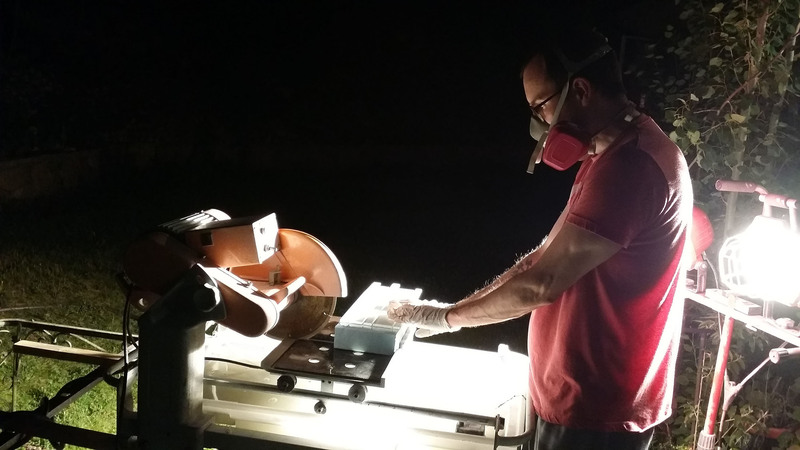 We have a good start on my DIY cabinets and a few other things – but have a ways to go. And now excited to share with you my DIY Kitchen earth-friendly non-toxic tile backsplash project! In my pre-flood kitchen, I didn’t have a backsplash. For thirty years, just never got around to it. I often wished for one, however. 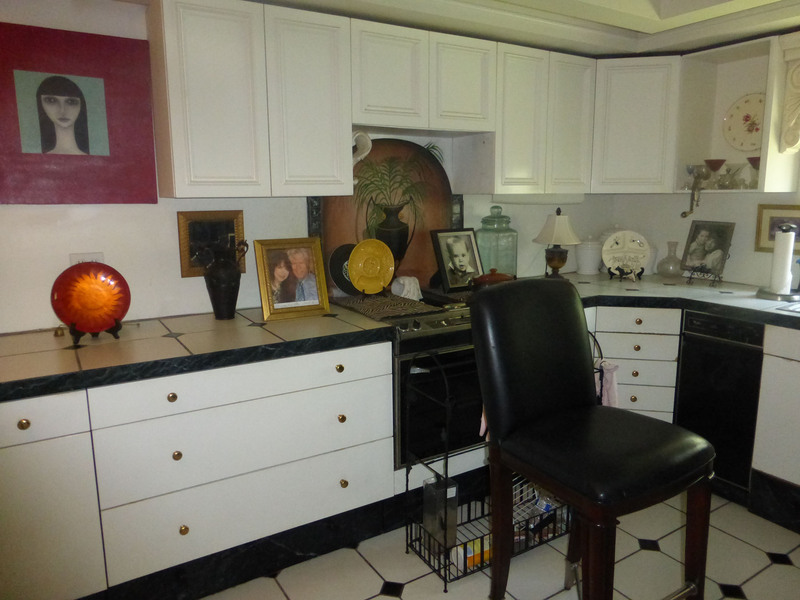 The white kitchen walls sustained oily stains and general discoloration, especially around the range. Here she was, albeit a bit cluttered at that moment. Always loved displaying photos and heirloom items I adore. I just simply loved looking at them every day. (Painting by my artist son, Gavin, has been relegated to my office.) Note my Mural on the wall, soon to disappear. The new kitchen will be a sleeker, more contemporary look. 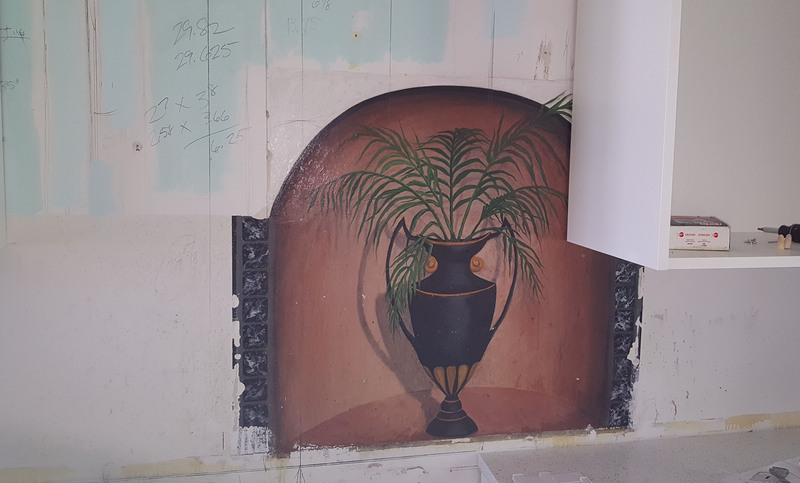 What I used to paint my fantasy mural ‘Urn With Palm Fronds’ including faux marble tile & grout, I’ll share soon on my DIY page. My new cabinets covered part of the mural so it had to go. But, time for a whole new look anyway, right? 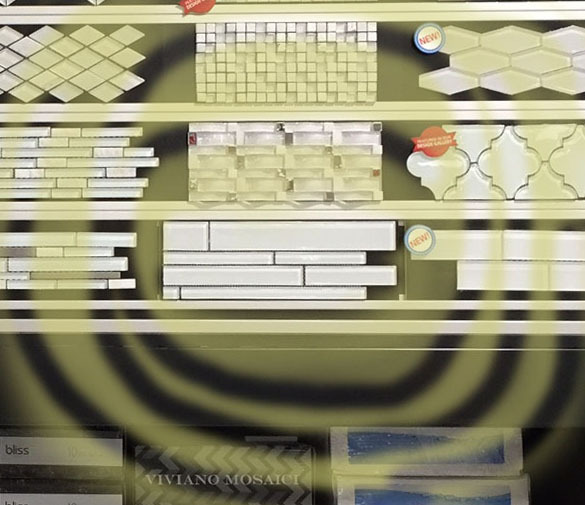 FINDING MY NEW BACKSPLASH TILE for my DIY Kitchen earth-friendly non-toxic tile backsplash project! First thing I did was go online to look for something I was crazy about. looked and looked and loooooooooooooooked, till my eyeballs went buggy! FINALLY. I found a beautiful glass tile I loved. But EEEeeeeooooEEEEEeeeee! Pricey! I used to do Design work for clients, so I went to some of my old stomping grounds around town. Beautiful Tile & Marble Places. I only ended up WORN OUT. I found some similar styles, but even at Contractor and my Designer Prices…. Also Pricey!!! WELL! SO FAR SO GOOD… BUT JUST ANOTHER BIG BOX STORE? *This post is sponsored by Floor & Decor. All opinions are my own. On that note, I write about the things I use, experience, find valuable, then choose to pass on to you! What met my happy RELAXED EYES was what seemed to be endless beautiful tile. But could they possibly have what I was looking for? Whaaaaaaa? Same as the one I fell for online…with a MUCH LOWER PRICE TAG! INSTALLATION…….. WHAT UP WITH THAT? I’ve never laid tile before, sooooo what next? I found out that FLOOR & DECOR does weekly classes! Very cool. This was so great. They are there to answer all your questions! Not only that, I had plenty of extra questions all along the way and I can’t say enough how awesome, friendly and helpful every person in that store has been. MAPEI Flexcolor: It’s GREEN! 😀 FLOOR & DECOR carries this waaaaaaaaaaaaay cool grout. I googled it and found it to be exactly what I was hoping for on my DIY Kitchen earth-friendly non-toxic tile backsplash project! 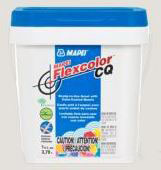 GROUT: MAPEI Flexcolor CQ is a professional-grade, ready-to-use specialty grout for precision commercial and residential installations with porcelain, ceramic and natural-stone tiles. Comes in a bucket with handy dandy flip-lid to keep it moist. Love that it’s Pre-mixed and Ready to Go! Two buckets were exactly right for what we needed. 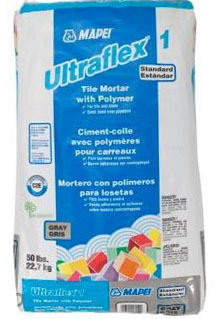 Ultraflex 1 is a standard-grade, single-component, polymer-modified thin-set mortar for most interior and exterior installations of tile. This mortar has an above-average content of a unique dry polymer, resulting in good adhesion to the substrate and tile. Mixes with water. 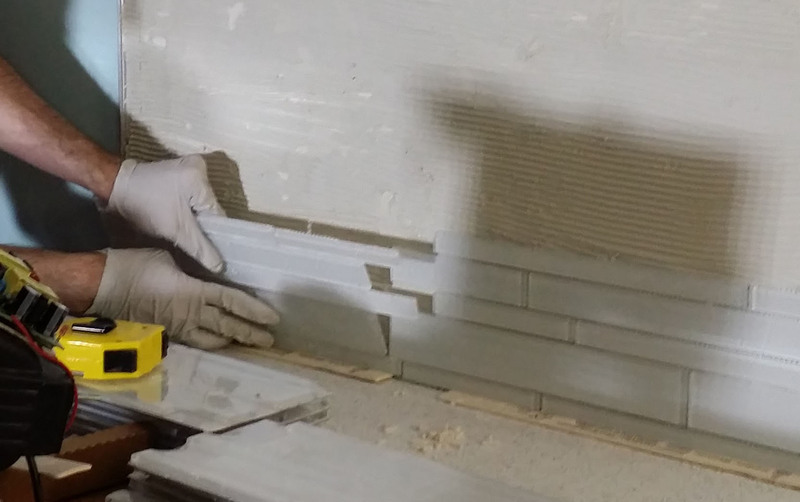 Now that I have my Dream Tile & Dream Grout, Tools & Know How – Time to dig in! Gavin cutting tile in back yard. We were fortunate to borrow this electric wet glass cutter. FLOOR & DECOR does sell a great variety of tile cutters from DYIers to the Pros! 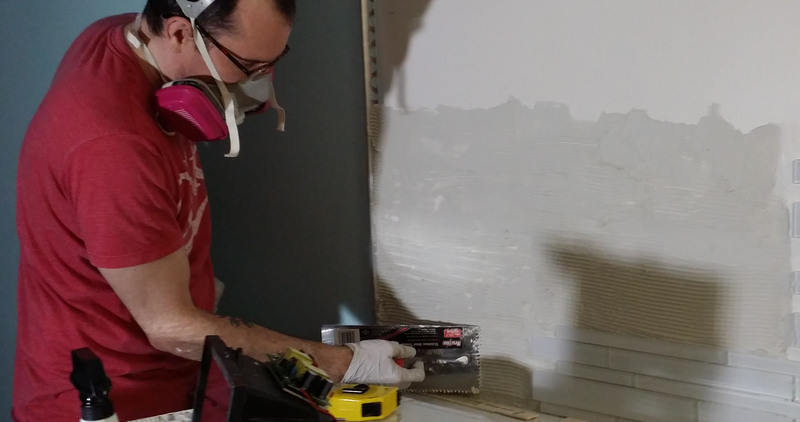 We put on a workable portion of the wall at a time with a putty knife. Then used the trowel to add the groovy grooves. Bye Bye, Mural! Here I am spreading mortar with the putty knife over the last remains of my artwork. 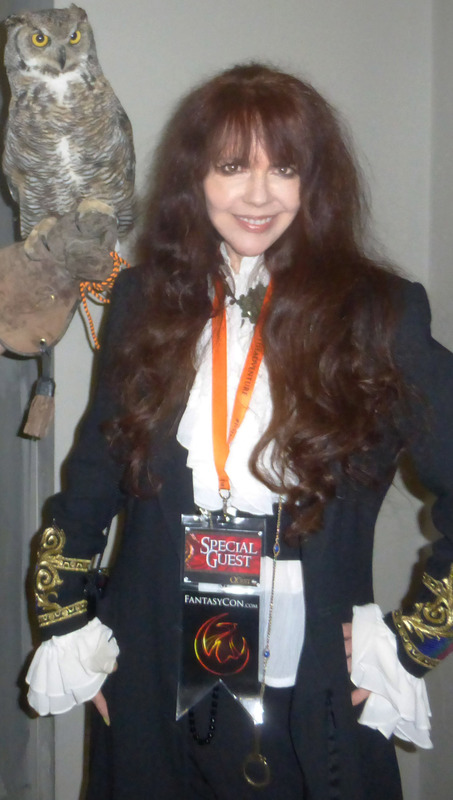 I felt a few twinges but I was certainly ready to finally get this new Show On The Road! Wall art that’s popped up when Gavin’s around must also be covered. 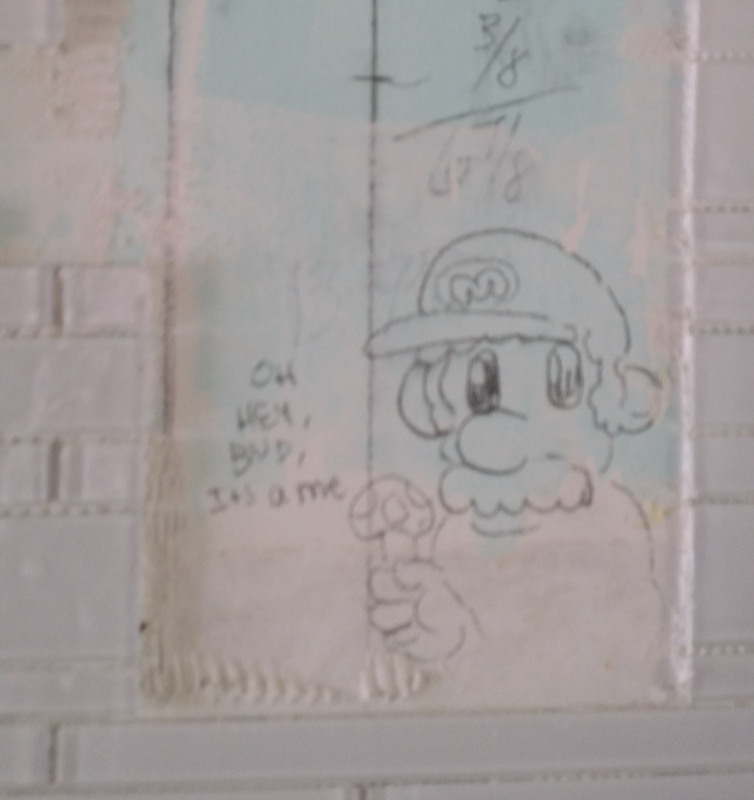 “It’s-a Me.” Hee Hee As you can see, we always find ways to have fun when life throws you curves. If you didn’t get it all…… Before grouting, it’s important to take a little tool like a small chisel and chunk out any left over stuff. And don’t forget the little SPACER thingies. Go around and pop all those little guys out before you begin grouting. I realized I’d missed a bunch, as hard to see with everything white. I used my jewelry making tool. Needle Nose Pliers or Tweezers would also work! Mapei Time! Wait 24 hours after setting the tile and away you go. Awesome stuff! It comes in a variety of lovely versatile colors. I chose white! No need to seal, as it’s non-porous. Now, I sure do like that. Must make haste when working to clean the haze. As one person fills in the grout, it’s a good idea to have another on their heels to sponge off the film left by the grout. There are cleaners made specifically for that. I’m sure they work very efficiently. As I don’t like using cleaners with toxic ingredients, I tried my good ole’ vinegar recipe. DIY VINEGAR HAZE REMOVAL FORMULA: Mix one part White Distilled Vinegar to 4 parts warm water. I put it in a medium plastic storage container to dip sponge in. Continually rinse sponge with clean water, so as not to dirty vinegar solution. I don’t yet have running water in my kitchen and found the warm vinegar formula hard to maintain. So I ended up using this cleaner. Non-toxic and worked great! I’m not going to say this whole thing was easy. It was hard work and I was tuckered when we were through. HOWEVER, it was SOOOOO WORTH IT! Woo Hoo! What a difference a day makes! I walk in my kitchen now and can hardly believe the difference. I absolutely LOVE it. The glass is so beautiful and shiny with a translucent feel. It’s pretty at different angles and the white grout even enhances it. SNEAK PEAK – FINISHED KITCHEN COMING SOON! 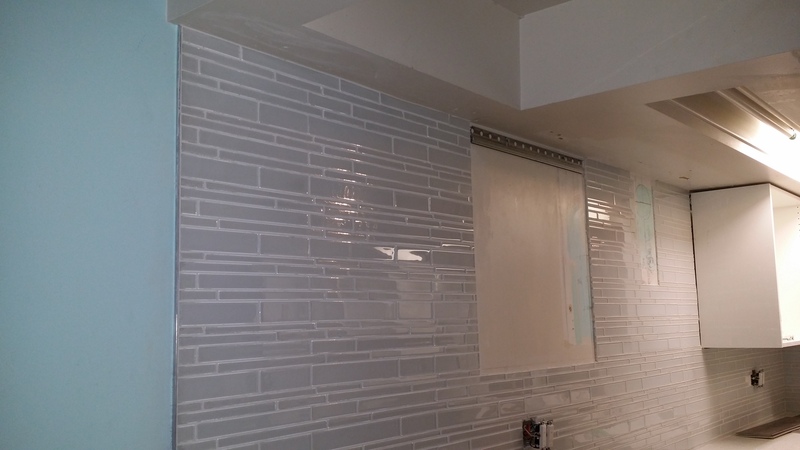 I’m not showing you all the kitchen tile yet. I’ll wait until I unveil the ‘Big Picture’ when I put everything together. 😉 But I’ll be showing you things and products in snippets along the way! Floor & Decor! My local store is located at 12101 S. State Street. in Utah. 801-981-1792 It’s just across the Freeway North a bit from IKEA. 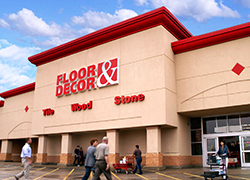 FLOOR & DECOR has stores all over the country. You can also buy online! 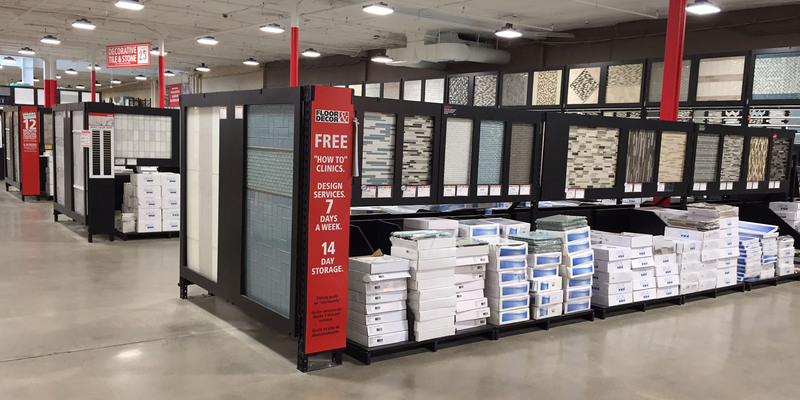 But if you have one near you, I highly suggest you go in to the store for the Fun Experience, the wealth of Helpful People, Backsplash Eye Candy and miles of Fabulous Flooring! 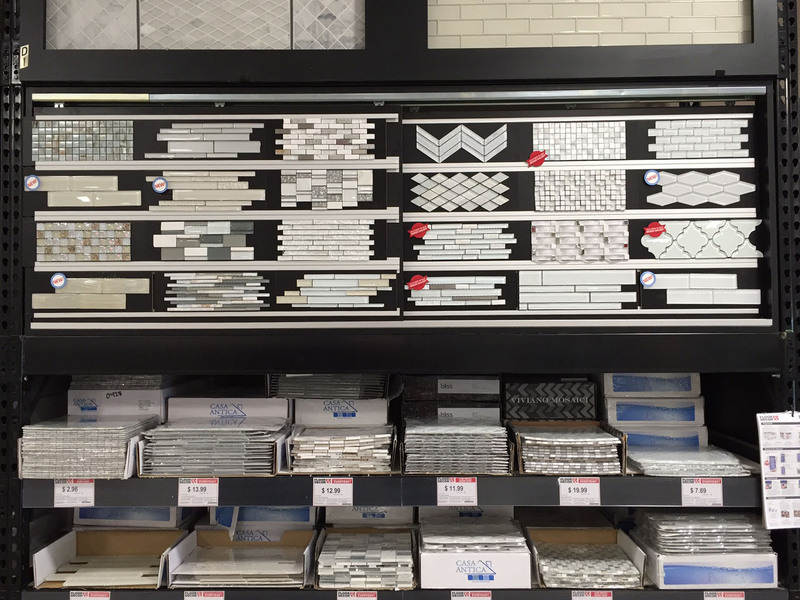 Plus, the backsplash or floor you fall in love with is right under your nose & IN STOCK – NO WAITING! 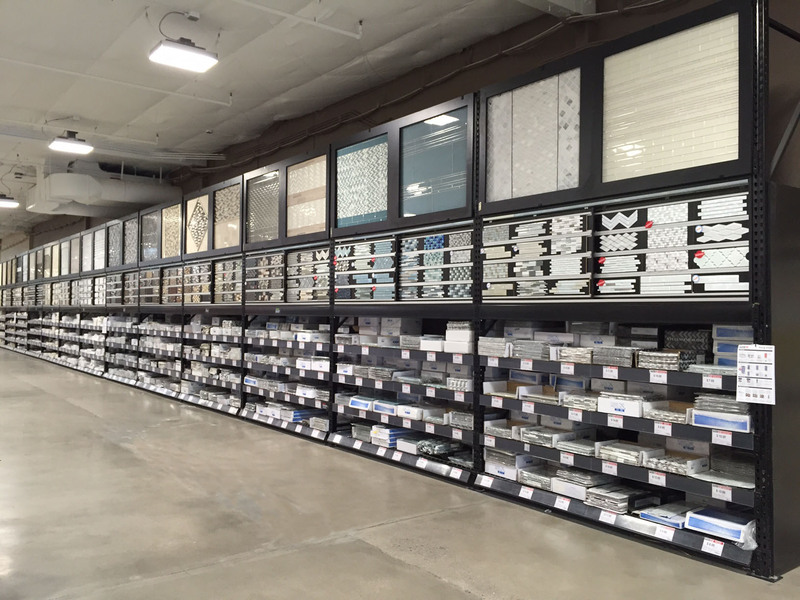 Here are just some of the advantages you’ll find at Floor & Decor! Design Service: Erin Boekweg is the Design Manager in the Draper store and is delightful. This service is invaluable to those who don’t have a clue where to begin, just can’t decide what they want or simply need some guidance or inspiration. And it is totally FREE. Pro Services: Contractors, Designers & all Pros in the Industry are treated like Royalty! You will enjoy all kinds of perks and services. Give your local Floor & Decor a call! 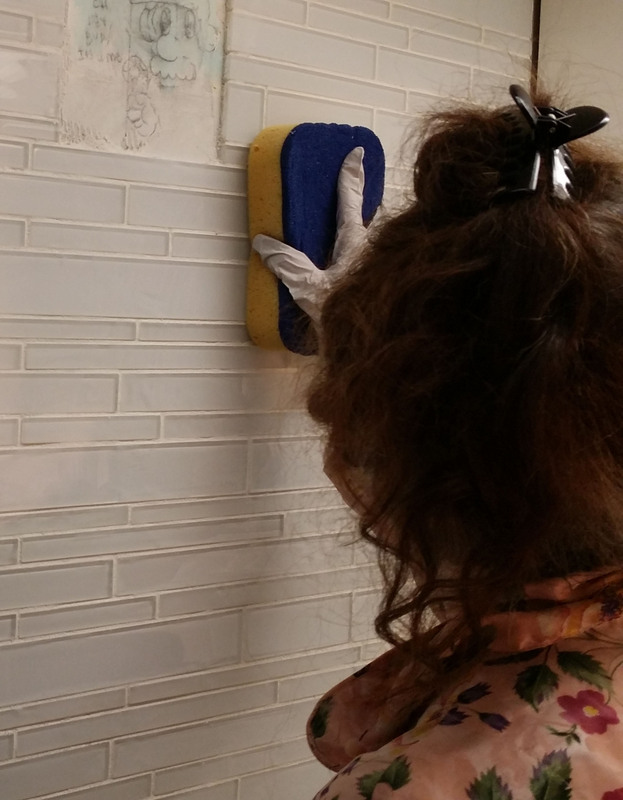 Thank you for reading about my DIY Kitchen earth-friendly non-toxic tile backsplash project! I hope you enjoyed this post and found it helpful! I would love to hear your thoughts in the comments, below. Tell me about YOUR remodel adventures! My DIY Kitchen earth-friendly non-toxic tile backsplash project! I’m having FUN! Yay! Wow! That looks great! Now I know where to go for my project! Your finished project (at least what you showed us) looks rather amazing! I wonder, though, from what you said if it is possible to do the same thing with only one person, or is it a requirement to have two people in order for the project to turn out? I want to begin my own kitchen remodel, but I am a single mother and don’t really have any adequate assistance other than the help my children try and give me. Any words of advice for us single mothers out there? cool tile! can’t wait to see it finished. My Foodie Son – A Happy Cooker!